“West 23rd Street.” Home to Best & Co’s “Lilliputian Bazaar,” Bonwit Teller (“Women’s Outer Garments”), Waterbury Dental Parlors and Eden Musee. 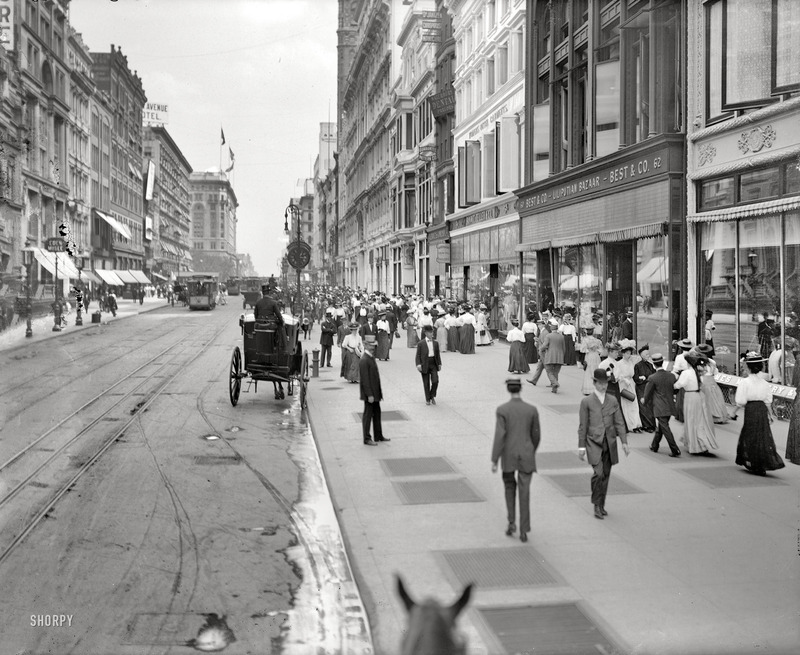 8×10 glass negative, Detroit Publishing Co.
What was that all about, I wondered. Were they seldom used first names? I had never heard them before in conjunction with Bonwit. Long before the days of digital photography and smartphones, and without my trusty Brownie in my hand, I was unable to capture an image, but it remains seared in my memory because it was peculiar. I never passed that particular spot again, at least not knowingly. And, given the absence of the internet, there was no way of ferreting out the story; as time went on, I began to wonder if I had imagined it. Had I been wealthy enough to be purchasing furs, I might have found out – but thanks to the infinite capacity of the intertubez, I at last have my answer. 1954 ad for Gunther-Jaeckel furs, 5 years before its acquisition by Bonwit Teller. “In a gilded age when sables were a princess’ best friend, the nation’s best place to buy sables was Manhattan’s C. G. Gunther’s Sons. Founded in 1820 by a German immigrant associated with Fur Trader John Jacob Astor, Gunther’s not only combed Siberia for the finest sables, but bid in the London market for the finest ermine, sent its agents across Canada on the lookout for mink. Even men coveted the Gunther’s label. Gunther’s long operated the only men’s fur department in Manhattan, offering coats made of every kind of fur, from buffalo, favored by post-Civil War tycoons, to collegiate raccoon. But sables for the ladies inspired the legends. On Black Friday of the 1929 crash, Gunther’s delivered a $70,000 sable coat to a customer, needlessly worried about payment (the customer settled in 60 days). Later it sold a shopper two sable coats, one for herself and one for her sister. As a token of esteem, the shopper bought her maid a mink. The bill: $107,000. 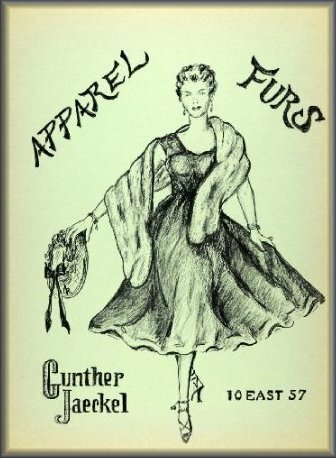 In 1949 Gunther’s merged with an other old-line furrier, Jaeckel, Inc., founded in 1863. Interestingly enough, Gunther-Jaeckel still shows up in random Yellow Pages business searches with an address of 10 East 57th Street, as listed on the advert above. 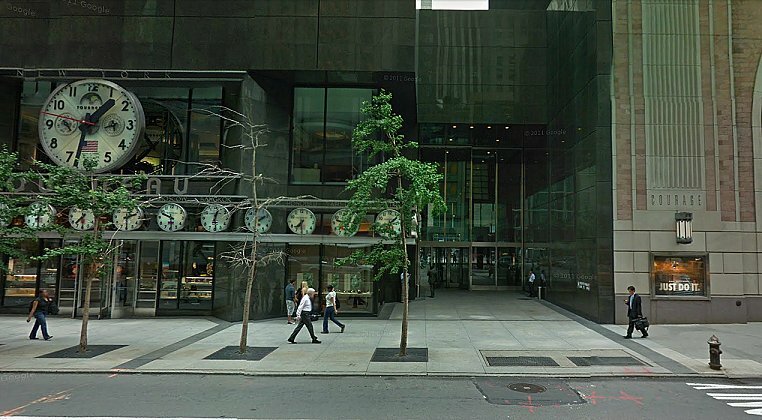 That matches precisely with my memory – the fact that it’s right next to Tiffany’s, another Hoving Corp. property cements the image in my head. Sadly, the building where the plaques appeared is now gone, replaced by another new skyscraper. This is where 10 East would have sat. But in retrospect, it’s nice to know I wasn’t crazy, all those years when I wondered if I had just seen something that wasn’t there.